A story circulating on Facebook lauds Dan Maffei, a democratic congressional representative from New York, who asks fellow legislators to rid the Washington Redskins of its name. 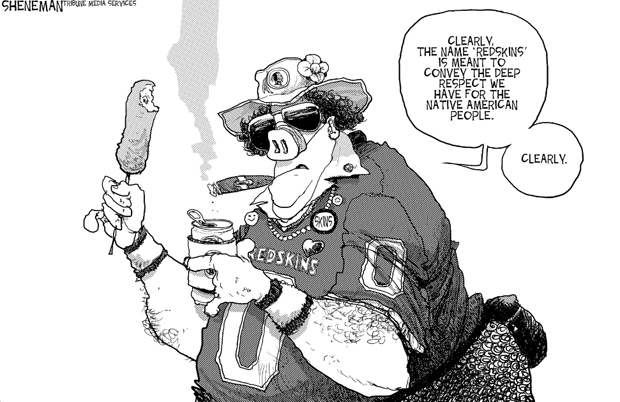 American Indians and others detest the use of Redskins for the sports team, arguing that it is offensive in the worst way. Imagine a team called the Darkies. The Coloreds. The Yellowskins. The story can be found at the Washington Post’s website in an article by Dan Steinberg. Wouldn’t it be great if, in order to show reverence and respect for…Native American tribes across this country…we change this NFL team’s name? As I’m reading the story suddenly an image of the Redskins pops up, asking me if I want to buy a billed cap plastered with the team’s mascot and insignia. How bizarre that I’m reading a purportedly unbiased account of a genuine news story when confronted with an advertisement asking me to buy a product that promotes the very racism the story decries. This entry was posted in american indian, authenticity, ethics, Indian, journalism, native american, native press, Native Science, Redskins, science, science communication and tagged American Indian, Indigenous Science, stereotypes. Bookmark the permalink.